You have seen this on Facebook. Please share the annotated version widely. I’ll say what I have to say (comments closed) and move on. If you wish to discuss further, hit me up on Twitter or pingback to the blog. Want to talk in private? Click the About/Contact link up top. Also, Justin Aion—middle school teacher extraordinaire—wrote up his views on the matter. You can read them over in his house. You only subtracted 306 from 427, not 316. You need to subtract another 10 to get the correct answer of 111. I cannot say whether this was the right task for this child at this time because I do not know the child, the teacher or the classroom. Analyzing errors is a useful way to encourage metacognition, which means thinking about your thinking. This is an important part of training our minds. The number line here is a representation of a certain kind of thinking—counting back. The number line is not the algorithm. The number line records Jack’s thinking. He counted back from 427 by hundreds. Then he counted back by ones. He skipped the tens. We can see this error because he recorded his thinking with a number line. Coincidentally, the calculation in question requires no regrouping (borrowing) in the standard algorithm, so the problem appears deceptively simple in its simplified version. This task is intended to help students connect the steps of the standard (simplified) algorithm with reasoning that is based on the values of the numbers involved. Why count back by three big jumps? Because you are subtracting 300-something. Why count back by six small jumps? Because you are subtracting something-something-6. Wait! What happened to the 1 in the tens place? Oops. Jack forgot it. That’s his mistake. The Common Core State Standards do require students to use number lines more than is common practice in many present elementary curricula. When well executed, these number lines provide support for kids to express their mental math strategies. No one is advocating that children need to draw a number line to compute multi-digit subtraction problems that they can quickly execute in other ways. The Common Core State Standards dictate teaching the standard algorithms for all four arithmetic operations. 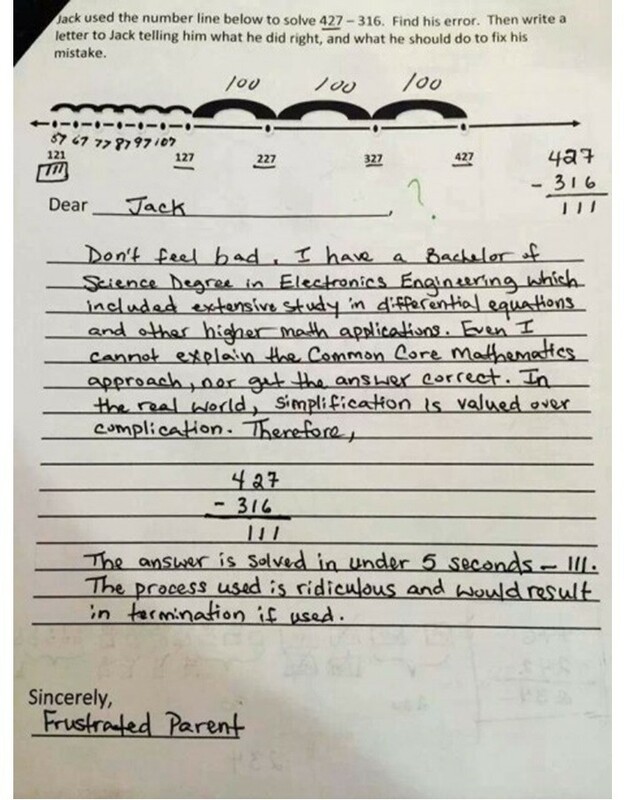 But the “Frustrated Parent” who signed that letter, and the many people with whom that letter resonated, seem not to understand that they themselves think the way Jack is trying to in this task. Here is the test of that. What is 1001 minus 2? You had better not be getting out paper and pencil for this. As an adult “with extensive study in differential equations,” you had better be able to do it as quickly as my 9-year old. He knows with certainty that 1001 minus 2 is 999. But he does not know how to get the algorithm to make that happen. If I have to choose one of those two—(1) Know the correct answer with certainty based on the values of the numbers involved, and (2) Get the correct answer using a particular algorithm, but needing paper and pencil to solve this and similar problems—I choose (1) every time. But we don’t have to choose. We need to work on both. A smart friend (whose permission I have not asked) read an article of mine that will be published in Mathematics Teaching in the Middle School sometime soon. The article is based on my NCTM talk last spring, titled “They’ll Need It for Calculus”. For clarification: are you arguing that the sorts of problems that you point to will help students better understand calculus, or that these sorts of problems will help students do better in their calculus classes? I was pretty sure that you were making the first argument, but not the second. That these two things are different from each other is a pretty damning critique of the whole affair, is it not? Conversation number 1 is the reason they are students, and the reason you are a teacher. What they should know is not relevant here; only what they do know is. So let’s factor that into our instruction. Of course, the problem is deeper than a handful of students who accidentally say ironically stupid things. The problem is that American high school students are taught something named “math” for four years which is not even close to math. Pretty sweeping generalization here. But I don’t disagree with the basic premise, which is that we aren’t doing the job of bringing mathematics to students (and students to mathematics) that we should be doing. I do disagree that the K-12 system is the only place this problem exists, but let’s get back to the matter at hand. I fear my rant may disguise my true intentions: the problem is not the content. Geometry and calculus and algebra are very fine subjects of mathematics. The problem is that they’re taught in a way that strips out all the math and leaves a vapid husk of an education. Now things are starting to spin a little bit out of control. Vapid husk of an education? Wow. [I]f you give me an hour with a group of disillusioned but otherwise motivated high school students, I can teach them more mathematics than they have ever done in their entire lives. I can give them a dose of critical thinking and problem solving like no algebra problem can. I teach at the college level these days, so I am accustomed to this sort of bravado. I try (perhaps unsuccessfully) to avoid it in my own writing because it is (a) unproductive, and (b) false. But my beef isn’t so much with the author (although…) No, my beef is with EdSurge. Why not feature the vibrant work that is going on in K—12 math education? Why not republish Fawn Nguyen’s brilliant reformulation of a crappy textbook problem? Why not post Andy Schwen’s video of a kid talking about the relationship between slope and rate of change while working on Function Carnival? Why not feature the work of people trying to bring real mathematics to young children? Moebius Noodles, Math in Your Feet, Talking Math with Your Kids, Math Munch—these are projects where people are working on a daily basis to help parents, teachers and caregivers to support meaningful mathematical thinking for children. No bravado. No blame. Just hard working, thoughtful people working to solve a problem. Because there is a problem. For sure there is a problem. But an hour with Professor Awesome isn’t going to solve it. Here are two questions we can ask about educational technology. The differences between them are important. Is the activity this technology supports more intellectually stimulating than what children would otherwise be doing? Is the activity this technology supports more intellectually stimulating than what children should otherwise be doing? I will confess, here, now and publicly that I hold (for example) Khan Academy to the latter standard. And, it seems to me, the typical defense of Khan Academy is that it should only be held to the former. Now, it seems to me that the children in the study were telling the researchers that there is something inappropriate about the activity when the 2-year old was trying to taste the waffle, and the 4-year olds needed to be coerced into not tap, tap, tapping everything on the screen. But if we imagine a perfected version of the app, optimized for the ways 4-year olds interact with electronics, then we can ask those two questions about the idealized waffle-cutting app. If kids are cutting virtual waffles in a daycare environment that otherwise provides little to no math talk, then perhaps this app would be an improvement. But I cannot really imagine an app that would be better than having children cut real waffles and talk about the nature of their activity with sympathetic adults as they do so. I cannot imagine a virtual waffle app that is better than what 2—4 year olds should be doing, which is talking math. My electronic colleagues worked very hard this summer on issues of inclusiveness, welcoming and participation in our electronic staff lounge. I kept quiet during this discussion because I didn’t have much to add to the conversation. I think a lot about status in my classroom. As teacher, I have a lot of power to influence the status of my students. By encouraging, valuing and using student ideas, I can help each of my students to be seen by others as a valuable member of our classroom community. By making sure I spread opportunities to speak, and by differentiating the ways that students are able to contribute, I can help to spread status more equitably. I do this imperfectly, but I do think about it a lot. I like to think that I get better each year. When I notice that I am doing a poor job of it, I try to change my ways. An important point is that status is conferred on others by social agreement, and that this agreement is often implicit. While I can influence the status of individuals in my classroom, I cannot impose it and neither can individual students. Now, it seems that all social spheres have dynamics that involve status. In any case, our sprawling electronic community of math (and other) teachers (and other interested parties) certainly does. I think that status is part of what my colleagues were sorting out this summer. If we are concerned with welcoming new people, and with making people feel like valued members of the community, we would do well to make conscious decisions about this. Don’t get me wrong. If you maintain a blogroll, more power to you. It certainly is a way of conferring status on colleagues, and it certainly can be a helpful tool to those who are new to the world of blogs. But I found that maintaining a blogroll meant that I was making more permanent judgments than I cared for. I didn’t edit it very often (too much work, and too low priority), and when I did edit, I didn’t like where my mind went as I decided which blogs to include. It felt too much like picking teams for kickball. When I killed my blogroll a while back (a year maybe? ), I pledged to more frequently link and tweet the interesting work of others. That has felt much more satisfying and effective to me. In sum, you don’t need to do what I do. I don’t advocate that at all. No, I advocate thinking about the ways in which all of us—high, medium and low status members of this community—can support positive social dynamics in this space. And I argue that paying attention to the ways we influence the status of our colleagues (and of ourselves) is one way to get better at this. That’s one of the things I struggle with. It’s clear to me that since I left the public school classroom in 2000, that the kinds of pressures and constraints under which teachers operate are quite a bit different. I have seen, over the years I’ve been working with teachers, a great degrading of teachers’ feelings of autonomy and ability to make meaningful decisions for their kids; particularly large decisions about curriculum, but even sometimes on a day-to-day lesson basis. All I can say is that when I do work with teachers who are under those kinds of constraints, the thing that I try to remind them is that curriculum—whether district curriculum or published textbooks—is really a framework, and it is a teacher’s job and responsibility to flesh out that framework in ways that will create powerful mathematics learning for kids. So I encourage you to not stray from the agreements that are necessary to make as a district or as a school—in terms of sequence of content, or basic resources we use in our classrooms—but that we have a tremendous amount of leeway in terms of setting the tone. What kinds of questions are we going to ask? What kinds of mathematical contributions are we going to value from kids? I think it’s important for us to retain that responsibility, even when we’re feeling disempowered by forces that are outside our control. And so I fear it is with the standard algorithm. I have heard it said that the use of this phrase (repeatedly) in the Common Core State Standards was a compromise (although I cannot find a source for this—leave any breadcrumbs you can find in the comments, won’t you?) It would satisfy some parties who believe that the standard algorithm is an essential seawall against the encroaching fuzzy math tide, while leaving the precise nature of the standard algorithm unspecified would appease those who argue that alternative algorithms are helpful in developing and maintaining children’s number sense. But if a compromise owes its precise nature to the fact that different parties will interpret the terms of the compromise differently, has there really been a compromise? Have we really made an agreement when we disagree about its meaning? Karen Fuson and Sybilla Beckmann, in their “Standard Algorithms in the Common Core State Standards” cite a CCSSM Progression document. In mathematics, an algorithm is defined by its steps, and not by the way those steps are recorded in writing. Hyman Bass, in his article from Teaching Children Mathematics, “Computational Fluency, Algorithms, and Mathematical Proficiency: One Mathematician’s Perspective” agrees. An algorithm consists of a precisely specified sequence of steps that will lead to a complete solution for a certain class of computational problems. So far, so good. We have accord on the meaning of algorithm. What is the standard algorithm? The definite article in the phrase the standard algorithm seems to be important to the alleged compromise I referred to. Here, for example, is Hung-Hsi Wu on standard algorithms. [T]he essence of all four standard algorithms is the reduction of any whole number computation to the computation of single-digit numbers. Wu states the following steps for the standard algorithm (.pdf) for multidigit multiplication. To compute say 826 × 73, take the digits of the second factor 73 individually, compute the two products with single digit multiplier— i.e., 826 × 3 and 826 × 7 — and, when adding them, shift the one involving the tens digit (i.e., 7) one digit to the left. He explicitly allows for moving left-to-right, as well as inclusion of zeroes instead of shifting. But explicit attention to place value in the process of working the algorithm seems to be proscribed. Contrast this with the following figure (click for full-size version) from Fuson and Beckmann. This figure is labeled “Written methods for the standard multiplication algorithm , 2-digit x 2-digit”. Note in particular methods D (lower left) and F (upper right). Method D shows that we are thinking 6 x 9 tens as we work the algorithm. Method F suggests that we are thinking 6 x 90 as we work. But wait. The lattice method is an example of the standard algorithm? Recall that an algorithm is defined by its steps. In Wu’s standard algorithm, you may proceed from left to right, or from right to left; either is acceptable. The lattice has both left/right and up/down steps, and you may do the single digit multiplication steps in absolutely any order. I cannot imagine that Wu would count the lattice as a standard algorithm, and I seriously doubt he would count partial products (method D) in that category. All of this got me thinking about whether there are any non-standard algorithms for multi-digit multiplication in the viewpoint that Fuson and Beckmann present. Pretty much every multiplication algorithm I know is in that Fuson and Beckmann figure. Every one except the Russian Peasant Algorithm, that is. I have argued that the compromise of using the standard algorithm but not specifying the standard algorithm in the Common Core is problematic because different people mean different things by it. The lattice is explicitly counted in the standard algorithm by Fuson and Beckmann, but our agreement on what constitutes an algorithm (a precisely defined series of steps) implies that the lattice constitutes a different algorithm from (say) partial products. Both cannot be the standard algorithm. But here is an alternative. What if Common Core, instead of using the language of the standard algorithm used the following construction: an algorithm based on place-value decomposition. Fluently multiply multi-digit whole numbers using an algorithm based on place-value decomposition. This construction would seem to include all of the algorithms in Fuson and Beckmann’s figure; it would make clear that the Russian Peasant Algorithm does not count; and it would be more transparent than the standard algorithm. Until and unless I receive cease-and-desist notifications, I will go ahead and use this version in everything I do. For your convenience, I have rephrased the various citations below. You can thank me later. 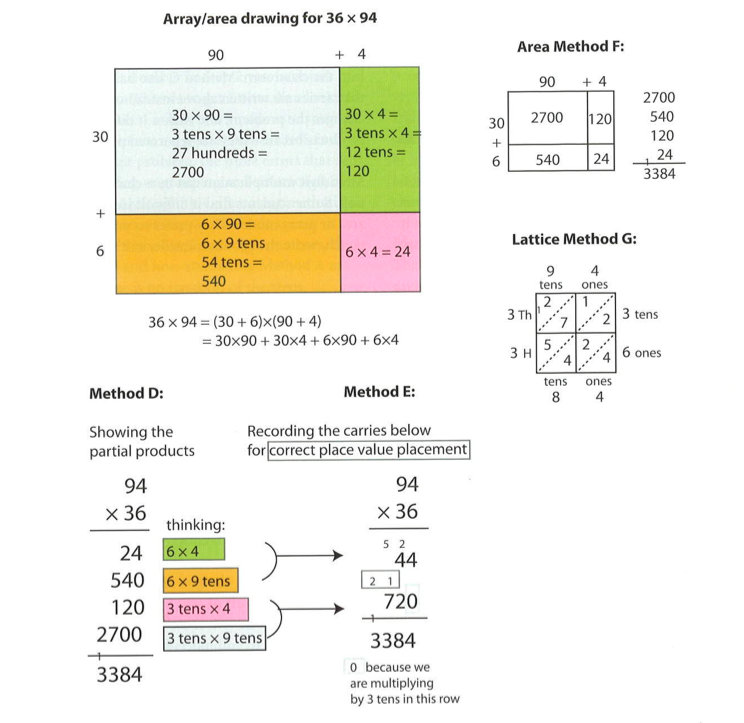 4.NBT.B.4 Fluently add and subtract multi-digit whole numbers using an algorithm based on place-value decomposition. 5.NBT.B.5 Fluently multiply multi-digit whole numbers using an algorithm based on place-value decomposition. 6.NS.B.2 Fluently divide multi-digit numbers using an algorithm based on place-value decomposition.